The first things Wes’s clients notice is his smiling face and sunny personality. As they get to know Wes, they soon recognize the high intelligence level that gives him a superior grasp of the various needs his clients have and the ability to choose the right solution from the wide spectrum of products available. Combined with his sincere approach, it’s easy to see why most of his clients work with Wes for a long time. Wesley White was born in St. Anne, Ill. on 20 April, 1941. After graduation from high school, he attended Pillsbury College and graduated with a BA degree in 1963. He then entered Central Theological Seminary and graduated with a Master’s of Divinity degree in 1968. 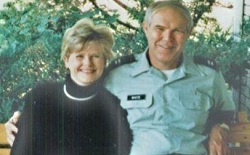 Upon graduation from seminary, he entered the Air Force and served as a Chaplain until 1975. After a brief absence from the military, he entered the Minnesota National Guard as a chaplain and served in that capacity until he retired as a Lieutenant Colonel in 2001. In 1980, Wes started his career in insurance industry seeking to help people with their financial well-being. Early in his career, he realized that the real need people had was dealing with pre-retirement and post-retirement needs. He has specialized in this market for over 20 years. In 1994, he joined the team at Golden Care USA, the largest agency in the Long Term Care insurance industry. With his broad knowledge of insurance, he found his niche specializing in helping people plan for their Long Term Care needs. He became a District Manager within his first year and began training and managing new agents in addition to helping clients himself. Even with the additional time spent, Wes was one of the top five agents from 1996 to 2003 and was the top agent nationally in 1996, 1997 and 1998! Although he cut back a little upon reaching age 65, rather than retire, Wes’s love for helping people keeps him busy meeting and working with his clients and meeting new people – and he continues to rank in the top ten agents each year! He has been married to his wife, Judy since 1965. Their four children have gifted them with eight grandchildren, hopefully with more in the future. Besides spending time with his grandchildren, Wes loves to read, especially the history of our country and it’s spiritual and political leaders who made America what it is today. He enjoys traveling around America to see all the beauty that exists in our great country. But, when pushed, Wes says he simply enjoys working – that’s what really keeps him going!